Over the last couple of nights, Mary and I watched a documentary on Mark Twain, directed by Ken Burns (who also brought us documentaries called Baseball, The Civil War, and Jazz). 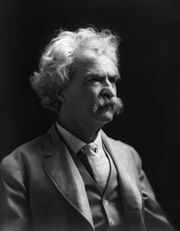 Mark Twain has been one of my favorite authors for a while – ever since I was a teenager and read The Adventures of Tom Sawyer and Huckleberry Finn. When I lived in Prague in 2002, I was looking around my school’s English library one fall day and found a biography of him (Mr. Clemens and Mark Twain by Justin Kaplan) and all of his essays in one volume. I read both of them that year. What fascinates me about Mark Twain is not just that he was a fantastic writer, but he led an intriguing and eventful life. He was born in a small town in Missouri, as everyone knows, and variously worked as a printer’s assistant, a riverboat captain, a prospector, and a journalist (among other things) before he began to earn money from his books. His was also a tragic life: even though he was a brilliant writer and made a comfortable living from his books, he was obsessed with investment schemes that would make him still richer. These invariably failed, and made it necessary for him to write and lecture constantly to get out of debt. His religious views also stand out. Whenever he was struck by tragedy (like when his younger brother died, or his son or his wife), he would blame himself, and then blame God. By the time he was nearing the end of his life, he was incredibly bitter, and wrote such caustic things that his wife insisted that he not publish them until after he died. What makes him so tragic from my point of view is that he had such a strong sense of injustice, and of right and wrong, and he was constantly aware of the failure of societies largely made up of Christians to do the right thing. But instead of condemning, for example, slavery from a Christian point of view (as many abolitionists did), he was painfully aware that slavery was also defended by Christians and chalked it up to hypocrisy. He sniffed out hypocrisy wherever it could be found – in the antebellum South, in Gilded Age New England, in the boardrooms of corporations and in the halls of political power. All too often that hypocrisy was perpetrated by people who called themselves Christians. Instead of dividing Christian ideals from Christian practice, he made sweeping judgments about God and his fellow men and women, and ended life as a bitter, angry man. But I don’t think that Twain ever came to an honest assessment of himself. People close to him recognized that he had a constant need to be the center of attention, and that this need could make him tiresome to be around. He went to his daughter’s wedding dressed in doctor’s robes given to him by Oxford University. He paraded up and down Manhattan streets in white suits, timing his jaunts so they would take place on Sunday just after church let out so everyone could see him. By the end of his life, I think, Twain had become so self-centered and so self-righteous that not even God measured up to his standards. He sat in judgment over everyone and everything. Little surprise, then, that Twain fully expected things to go his way at all times, and became very upset when this was not the case. I do hope, though, that he was able to make his peace with God before he died. Thank you, Jack Handey. You’re a comedic genius. I also hope that Mr. Twain made his peace with God. Because that is what matters most in this life, far more than acclaim, wealth, or happiness.